Serifos island, also spelled Seriphos is just waking up to tourism - Our suggestion...visit this island now before it joins some of the rest of the Greek islands that get overrun by tourists during the months of July and August - Long, sandy, tree covered beaches,traditional Cycladic architecture, good waterside tavernas and Greek friendliness and hospitality abound in Serifos. A good place to sit by a cafe right by the water and indulge in the Greek custom of people watching. 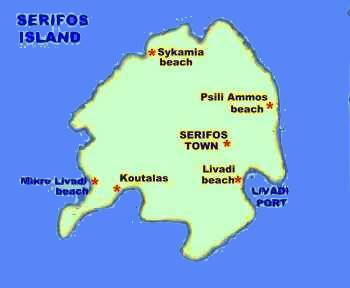 Serifos - A virtually undiscovered island - Once you visit the first time, you are guaranteed to return again and again! Easily the most visited and famous of the island chains. 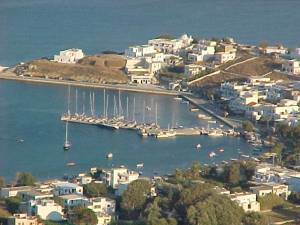 Each summer thousands of tourists take the ferry boats as they ply between the numerous islands that make up the Cycladic group. Santorini and Mykonos take the lions' share of visitors - who come to marvel at some of the most impressive views in the Mediterranean or revel in wild night life.